Yes, it happens to all of us … we have such high hopes for finishing those handmade gifts for the special people on our holiday lists, but the time just slips away! 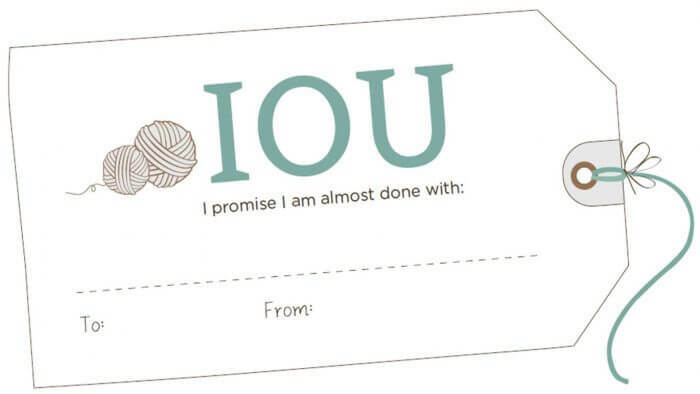 Well, Knit Picks has us covered with these fun and free IOU gift tags printable. Click here to download. Click here for more fun and free printables from Petals to Picots. I love this!! Sooo needed right now! Thanks! Merry Christmas and May the Lord Bless You !,,,best wishes !